ECommerce websites are a huge business and they’re only getting bigger. According to the US Commerce Department, eCommerce sales within the US alone totalled $194.3 billion in 2011. Whoa! This figure is only going to increase as more and more people see the benefits of buying & selling online. If you’re looking to create an online store for your product, what better way to do it than by using one of the most popular and robust Content Management Systems available; WordPress! There are several different eCommerce plugins available now for use with WordPress and one of the more recent arrivals on the scene is WooCommerce by WooThemes. Back on August 25 2011, WooThemes announced that they were about to release a new eCommerce WordPress plugin called WooCommerce. They did this by forking the JigoShop eCommerce plugin from Jigowatt, which was licensed under GPL. You’ll find numerous comments from within the WordPress community both for and against this and Jigowattt also posted their own views the day after the announcement. It’s eight months down the track now though and going on peoples reactions, it seems that WooCommerce is definitely making their mark in this field. After numerous updates, tweaks & bugfixes, the current stable version (as of this writing) is Version 1.5.4. One other extension that I think is worth mentioning is one that I found on the IgniteWoo website. WooCommerce Wholesale Pricing creates a “Wholesale Buyer” user role and adds a wholesale price field to all of your products. This allows you to create users that can view seperate “Wholesale” prices for each of your products, once they’re logged in to their account. The WooCommerce plugin installs like any other WordPress plugin. Upon activation, you’re prompted to let the plugin create a number of default WordPress Pages. These include account admin, shopping cart and checkout pages, among others. 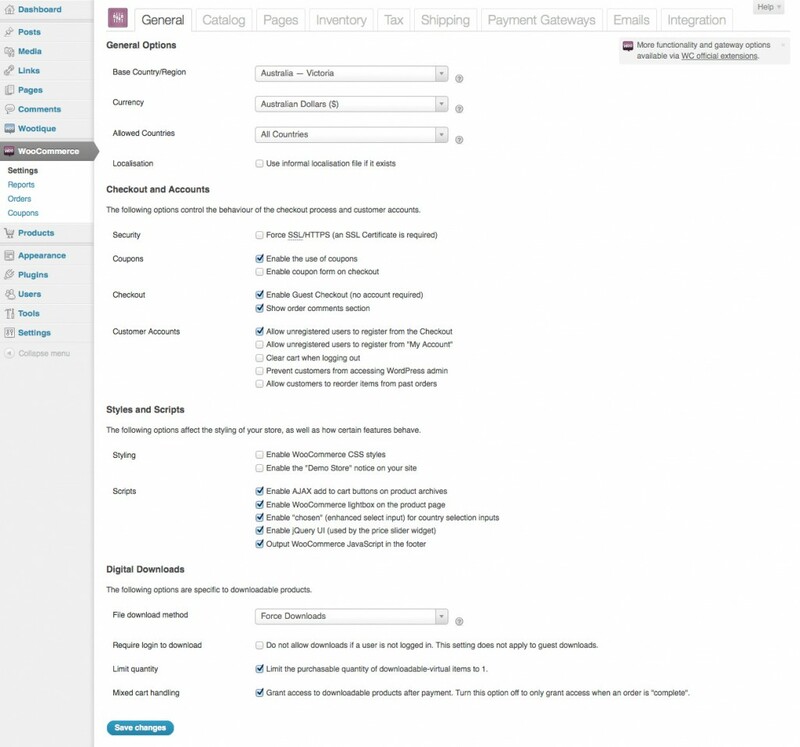 These default pages include the necessary WooCommerce shortcodes relevant to each page. Of course, if you don’t want to install these default pages, then you can simply skip this step. Prior to adding all your products to your store, there are a number of settings that need to be configured. All these settings can be accessed through the WooCommerce > Settings menu option. The General settings tab allows you to configure the base Country/Region for your shop as well as the currency and the countries that you’ll ship to and various other settings. 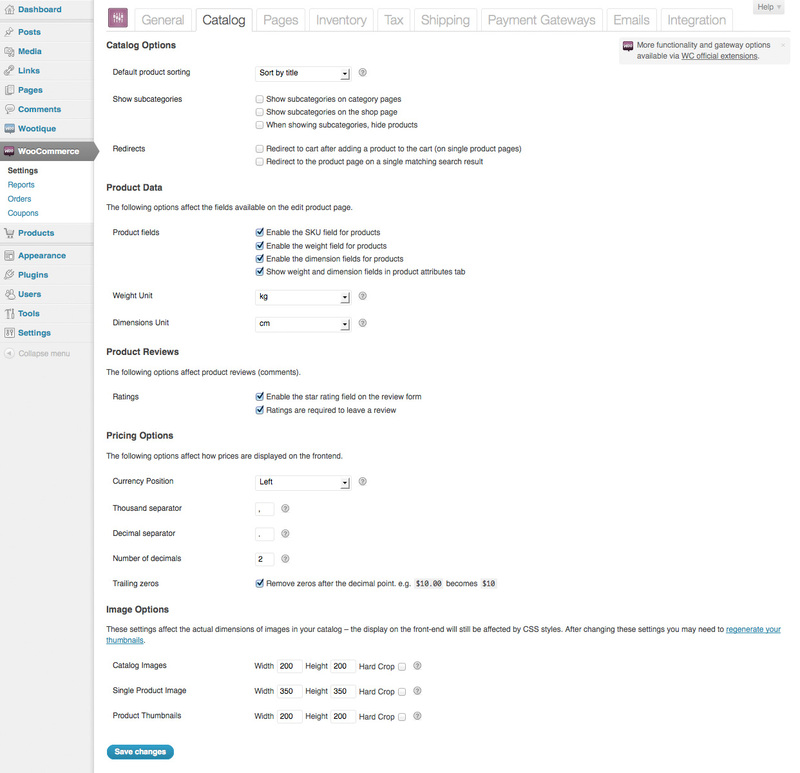 WooCommerce also comes with some default styling. You can enable or disable this CSS stylesheet here. The Catalog tab allows you to confgure your product data such as where Category information is shown, the units of measurement for products that specify the weight and dimensions, currency specifics and whether to allow product reviews. You can also specify the dimensions for catalog images, single product images and product thumbnails. The Pages tab allows you to configure which of your WordPress pages are used for each of the main pages within your shop such as displaying your list of products, customer shopping cart information, account information pages and checkout pages. Most of the pages defined here will be set to the default pages created during the plugin activation process, if you chose to allow WooCommerce to automatically create those pages for you. The Inventory tab allows you to define whether you keep track of stock. If you do, you can enable low or out of stock notifications and even stop out of stock products from displaying. The Tax tab allows you to configure tax rates, if required, including the ability to specify different rates based on the Country/State or a local Postcode/Zipcode. The Shipping tab allows you to specify the various shipping options available to your customers. You have the choice of Flat Rate, International Delivery, Free Shipping, Local Delivery & Local Pickup. Each shipping method also it’s own options that can be configured, based on the particular method. 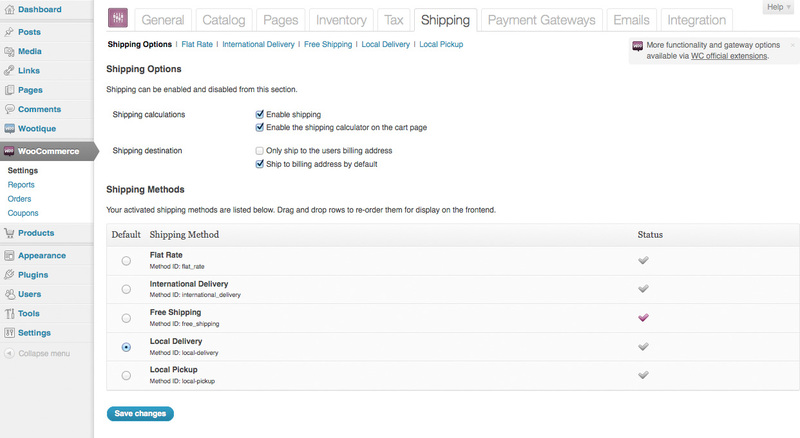 Shown below is the Flat Rate shipping page where you can specify the type of shipping calculation (ie. Per order, Per Item or Per Class), you can specify the default cost & handling fees along with any extra shipping options and rates. The Payment Gateways tab allows you to specify the different options for collecting payments from your customers. There are four default options available; Direct Bank Transfer, Checque Payment, PayPal and Cash on Delivery. As mentioned earlier, there are also numerous payment gateway extensions that can be downloaded from the WooThemes website. You’ll find that these will be specific to particular countries. Each payment method has it’s own settings page that can be configured. The options available will vary according to the payment gateway. Shown below is the PayPal settings screen that allow you to define your PayPal email address and a description to show your customers on checkout, among other settings. You also have the option to enable the PayPal developer sandbox which is extremely useful for testing payments when setting up your online store. The Emails tab allows you to configure email settings for administrators (eg. New order notifications or Inventory notifications) and customers. You can use the default email template and specify your own colours and header image or if you’d like more advanced control you can copy the email template and make modifications to that. The Integration tab lets you configure social media sharing options either via ShareThis or ShareDaddy, which is a sharing plugin bundled with JetPack. You can also add in your Google Analytics ID. The next task after configuring all your store settings, is to start adding your products. Thankfully WooCommerce makes this a fairly painless process. Simply select the Add Product option from the Products menu. 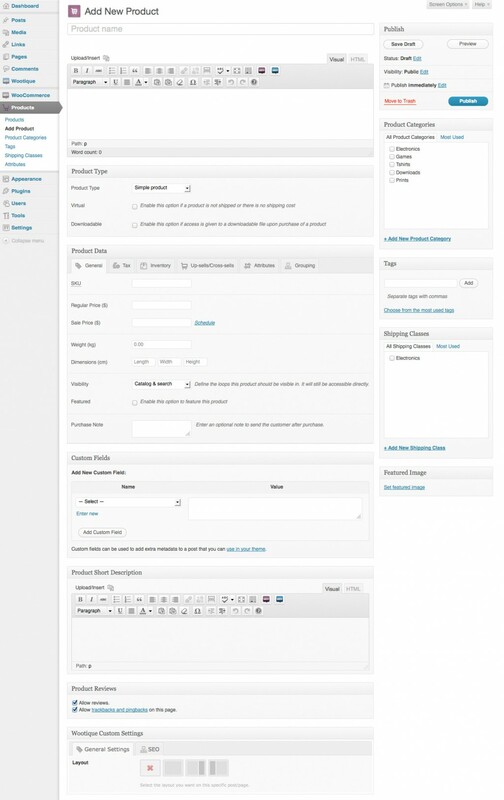 Since WooCommmerce uses standard Custom Post Types, the Add New Product page looks just like any other WordPress Post or Page edit screen, with the addition of some extra fields. When adding a product, you have the choice of four options; Simple product, Grouped product, External/Affiliate product or Variable product. You can also specify if the product is virtual or downloadable. When adding downloadable products, you are given the option to upload the file and specify download and expiry limits. As you’d expect, you can specify all the usual infomation when adding a product such as price (regular & sale), tax, weight & dimensions. You can also specify and track the stock quantity, if so desired along with other “related” products that you wish to up-sell/cross-sell. 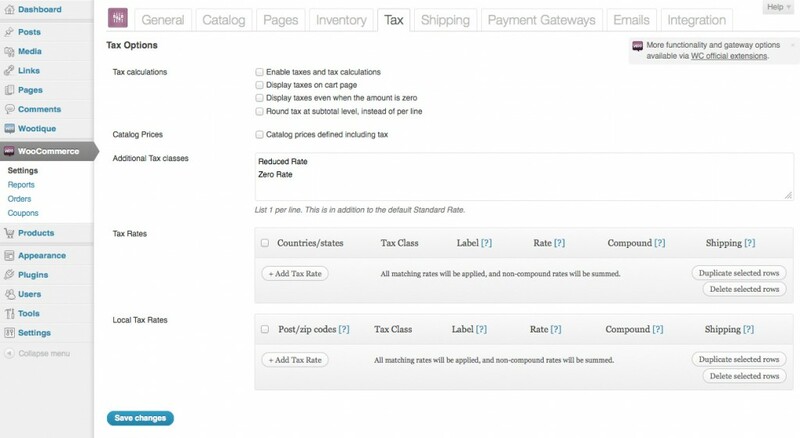 It’s here that you also specify each option for your variable or grouped products. If you’re interested in providing discounts for your customers, WooCommerce also allows you to create coupons. Coupons can be used to provide your customers a cart discount, a cart % discount, a product discount or a product % discount. 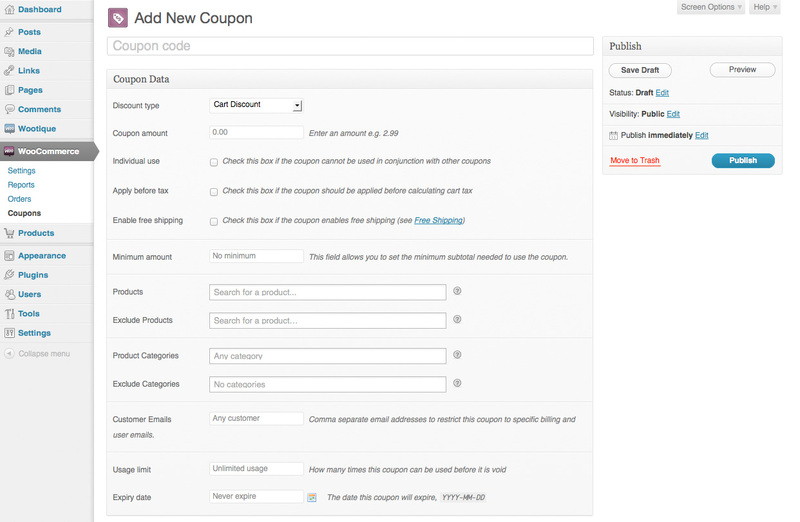 Coupons can be configured to expire after a certain usage limit, a certain date or even to never expire. You can also apply/exclude them to/from a certain product or product category. Since the WooCommerce is a WordPress plugin, it can be implemented in any theme you want, however if you’re not wanting to performing any extra styling yourself, then you’re best to implement the plugin on a site that has been optimised for WooCoomerce. The WooThemes site has a number of ready made themes that are styled specifically for the WooCommerce plugin. You can also find a number of other sites such as Themeforest or Mojo Themes that have various WooCommerce styled themes. One of the themes that I tested the plugin on was the Wootique theme. This is a premium theme that’s available for free from the WooThemes website. The WooThemes website also has a demo of Wootique using the WooCommerce plugin. I also tested the plugin using the standard Twenty Eleven WordPress theme. Although WooCommerce comes packaged with a default stylesheet which does look reasonably good (and can be disabled within the General settings page), you’ll find it’s not styled quite as nice as some of the ready-made WooCommerce themes that are available. If you’re interested in testing out the WooCommerce plugin, it comes with a dummy_data.xml file that you can import to populate your site with dummy data. Alternatively, you can also download this file from the WooCommerce GitHub site. 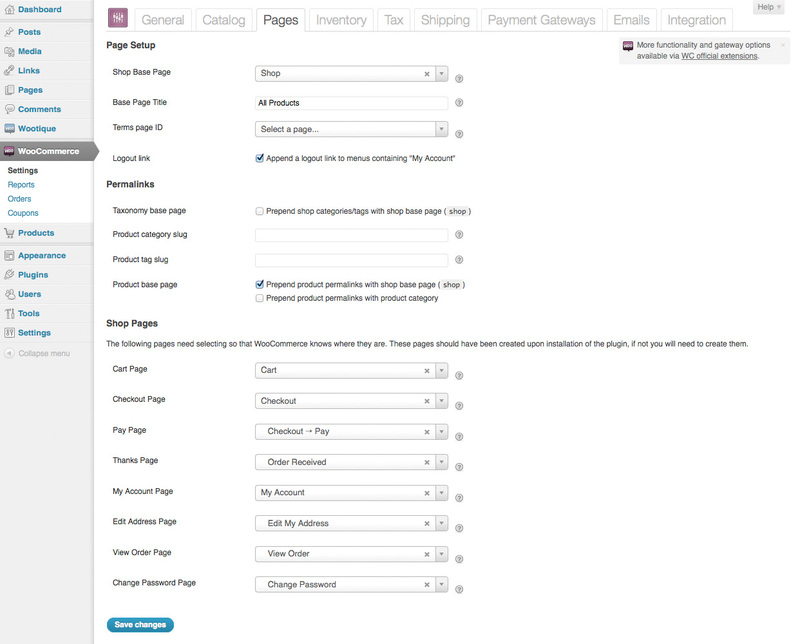 As mentioned earlier, when first activating the plugin, WooCommerce will create some default pages for you. To display other content within your theme, WooCommerce provides quite a number of different shortcodes. They also provide quite a few different Widgets that can be added to your site for searching, displaying ‘Featured’ products, displaying product categories & tags and displaying recent reviews, just to name a few. Like all good shop owners, you’ll want to keep track of all your product sales and orders. There are anumber of built in reports that allow you to do just that. There are reports for Sales (Incl. Overiew, Sales by day, Sales by month, Product sales, Top Sellers and Top earners), Customers and Stock. Using the Orders menu option you’re also able to view a list of all the orders made. Clicking the Order # displays the order in full including all the products for that particular order (& variations if appropriate), the customers details and total costs (incl. discounts & tax). Overall, I think WooCommerce is an extremely solid eCommerce plugin. It has a wealth of standard features and is fairly straight forward to setup, no matter whether you’re using a WooCommerce optimised theme like Wootique, or your own custom theme. The interface is very easy to use and will be very familiar to anyone who’s used the WordPress Dashboard. The settings pages has the familiar WordPress layout, utilising the tabs across the top of the page. It’s good to see this standard WordPress layout, unlike some theme or plugins that opt to style their settings pages completely differently. Adding products into your store is also very straightforward. It also provides quite a few choices, as standard, allowing you to setup various types of products. The WooCommerce site also provides some decent documentation if you need to use it and although I didn’t look through it all, the pages I did look at were well written and easy to follow. Overall, if you’re looking to implement an eCommerce solution using WordPress, you’d be wise to checkout what WooCommerce can do for you. I would be wary of Mijireh… I paid for their professional installation and 24 hours later I have three unanswered emails and no results. That is real shame, because if their support measured up to their marketing, they could be useful. nice affiliate article you wrote there, complete rubbish, you forget to mention that when it comes to real ecommerce woo is nowhere near up to grade, its documentation is poor, ie how do you change the text in your sent email, they are all disordered because wordpress is meant for blogging!! Not Shopping!!! Of course you wont allow this comment because you probably are a communist. Thanks for your comment Lawrence, even though it is extremely misinformed. I don’t have any association with WooThemes, even through an affiliate program. You can even see that none of the above links are affiliate links if you’d care to look. If you want to change the text in your sent emails, you have a number of options, depending what you want to accomplish. 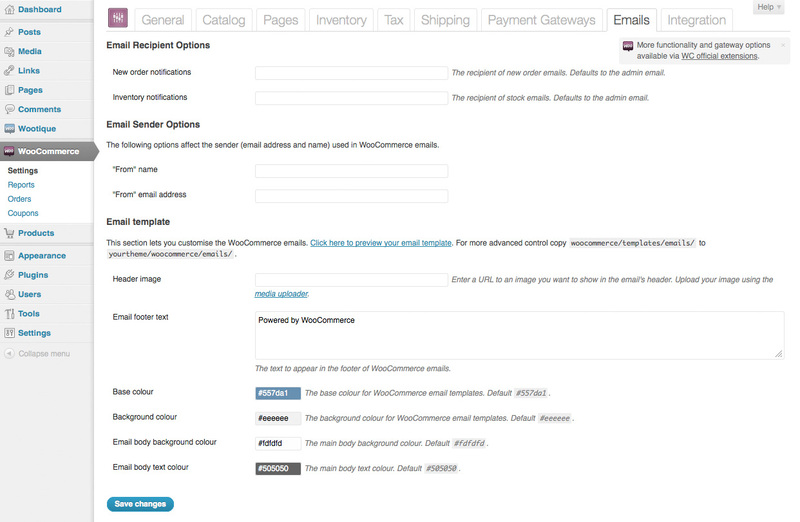 As mentioned above, there are various options within the “Emails” tab on the WooCommerce Settings page. If you want more control, you can simply override the email template. You obviously haven’t used WordPress in years if you think it’s simply “meant for blogging”. Years ago, that might’ve been the case, but not now. It’s an extremely powerful content mangement system. If you want to see just what you can do with WordPress then I’d suggest you go have a look at the WordPress showcase and just take a look at the variety of sites that are currently using it. seems like lawrence as a thing out for woocommerce and wordpress lol. Get educated before posting lawrence. And to the op great read. Ive been using woocommerce since it was forked over from jigoshop and enjoy it quite a bit. when oh when would the internet just be for the information? Author you also failed to mention that the table rate plugin which you very kindly linked too, is an essential part BTW, has just gone up in price from $75 to $95, looks like open source has gone commercial. I wont be using woo, thanks for the offer. As bad as WPEC is, it works. You’re right Duna, there is a lot of links to the WooCommerce site. You know why that is!? My guess is because it’s a review on a WooCommerce product! Would’ve seemed kinda stupid to link to other websites! You’ll also find that I didn’t mention the price of ANY extensions. If the plugin is valuable and is used extensively in your particular WooCommerce setup, then the price shouldn’t matter. Thanks for leaving such a valuable and worthwhile comment. You can be condescending as you like, the point is that you are getting paid to sell their products. Please admit in your reply, that you are getting paid, so your readers know why you wrote the blog. Maybe not so stupid to link to other sites; If you were so genuine why have you never made reference to this link? Sorry to break it to you buddy, no affiliate scheme there. The whole point here, woo have lost the open source tag and you are promoting that. As I’ve already mentioned in my reply to Lawrence (above), if you care to check every single link in this post you’ll see that there is not even one affiliate link. So no, I’m not getting paid to advertise their products. I wrote the review because I happen to think it’s a good plugin. And I linked to the Woo site rather than the WP plugin directory simply because you can find more information on the plugin on the Woo site. The plugin is still open source, if you’d care to look. You find it in github. Yes and nobody has ever heard of tracking cookies – as they don’t exist yet, either that or you are a share holder, maybe even work for woo. Be a man and say why you wrote the article – be as honest as your article. So what you saying is the plugins that woo have to offer on their site are open source too? I understand a part of Lawrence’s frustration, though I don’t agree with how he tried to resolve it. Without a doubt, WooCommerce is a top-notch, free WP Plugin. However, like so many other free English/European software products I’ve used or even bought in the past, the documentation is truly poor and many times out dated and sketchy. Not only that, it’s fragmented all over the place. It seems that each coder or other person that employed by them has his own blog with more fragmented pieces of info all over cyber-space. 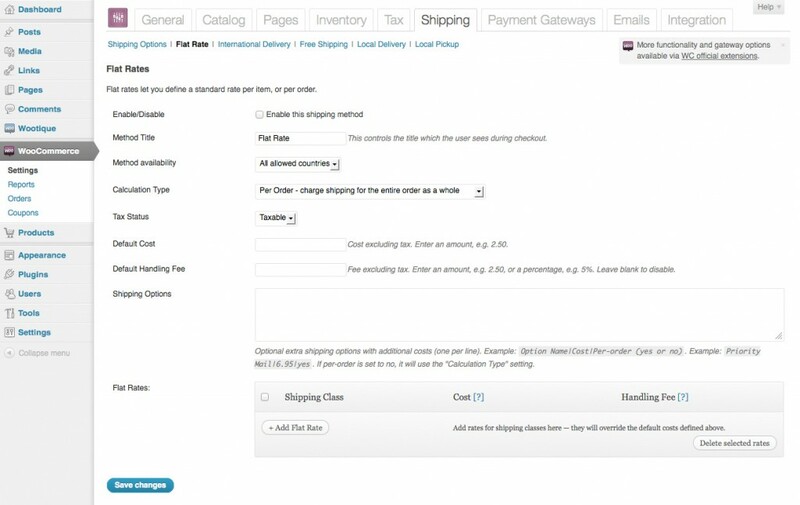 An example of sketchy, from the “official” WooCommerce User Guide” Sept 2011, under Coupon management, it says Coupon Code – the code the user must enter to use the coupon. There is a fairly nice “Apply Coupon” button along with a barely visible box to enter such code on the cart itself, but no one seemed to remember to let us know where to find that code. Not cool. I’ve spent hours trying to figure out where the code is, but because of the information fragmentation I previously mentioned, I could conceivably spend years and never find it. Like yourself I do believe that WordPress is much more that just for blogging. Sadly, free always comes at a price, just take a look at the total lack of instructions that come with most plugins, if at all! I suppose the premise is, I’m already giving you something for free that I spent my time building, why should I give you instructions as well? You go figure it out! I appreciate you taking the time to leave a comment. I certainly agree with your last point, in some cases. I’ve used numerous plugins and even themes that have a lack of decent documentation, which can be extremely frustrating. As far as the WooCommerce doco goes, I looked through a few pages when I was setting up their plugin, but I didn’t look at every page. The pages that I looked at seemed quite informative. Obviously, that’s not to say that every page is like that. Just having a look at the Coupon Management page, in the online doco, it looks like there’s a bit more content now than what you’ve mentioned, so it may be that they’ve updated it since you last looked through it. It says it was last updated on April 27, 2012 but doesn’t say what was updated. Coupons are something that a business would give out themselves, so I wouldn’t really expect the WooCommerce doco to go into how a “customer” gets a code. Typically, coupons are used for short periods like a stocktake sales, Christmas specials or even just for repeat customers, for example. How you use or distribute these coupon codes is entirely up to you. You may decide to advertise the code on your website or you may simply include it within your business email newsletter. I’ve seen other (software) businesses make mention of discount codes on Twitter or their Facebook pages. It’s entirely up to you how you want to use discount coupons, if at all. The coupon code that you’d supply your customers is whatever you’ve setup within your WooCommerce settings. You can name them whatever you’d like. So, if you look at the screenshot I included above, the text you type into the “Coupon code” field is what you would give to your customers. On the standard checkout page, it automatically adds in a field that allows your customers to then enter in a coupon code. This is then applied against their cart total. I’ve got one beef with all of this that people are complaining about. This is free software… what do people not get about free software? Instead of complaining like spoiled little brats that you are.. In reply to Lawrence; what absolute rubbish you speak. Whilst I completely agree with the overall “meaning” of your comment concerning documentation quality found with freebie (and many paid) plugins, we all need to keep this in perspective. WordPress provides and excellent platform for small to medium sized websites requiring a simple CMS function without too many collaborators. Joomla offers similar functionality but is not as “user friendly” for the first time web site owner. In all cases where free plugins are considered (by me at least) it is in response to the needs, tech level, expectations and BUDGET of my client. As I tell my clients, we offer three things, SPEED, PRICE and QUALITY and you can choose any 2. ANY free plugin that meets the reasonable expectations of the client in terms of features and performance is to be welcomed. It is our job, as web developers, to KNOW what plugins or extensions are available in the market, both free and paid for and to EXPLAIN clearly the options to our clients. Fpr me, WOO COMMERCE is right up there as an ENTRY LEVEL E-Commerce solution that I regularly offer FIRST TIMERS. Those that seek greater functionality need to dig deeper in to their pockets. thanks for a great article on using WooCommerce. I have been using it for a while and find it good, for a first timer. I do have one question I am trying to seek an answer for: How do you change your theme, or install a new theme for your WooCommerce store, without it affecting the rest of your WordPress site theme? Any help greatly appreciated. I was looking at the Wootique theme you were speaking about but can’t work out how to use it. You can change your theme within the Appearance > Themes menu option within the Dashboard. If you change it though, it will change the look of your whole site. The only way you can change just the eCommerce part of your site or how the products are displayed, would be to get some custom modifications done by a developer. Thanks for the in depth report Anthony, really appreciate it. I’ve been grappling with what to use for eCommerce when your website is built using WP for some time. As a designer I get the opportunity to try out various eCommerce platforms but when it comes to WP there really isn’t that much choice. I’ve been using Ecwid for those starting out or that have a small inventory, I’ve found they’re the easiest for my client to understand and manage themselves but from a design perspective it’s not that pretty even with heavy customizing plus it means the client has to manage the store AND the site separately so it’s not ideal. I’ve also found that a lot of platforms don’t cut it when it comes to meeting Australian needs like direct deposit, GST, AU payment gateways and Australia post calculations so your report was of great interest to me as you’ve pointed out some of the key issues I face. I also use Genesis framework for most of my WP sites and they’ve recently created a plugin that allows Woo and Genesis to co exist so yet another reason for me to try it out. Have you had any experience with Cart66? I would love to see more reviews in the future. Thanks for your comment. I’m glad you found the review useful. It’s definitely worth considering if you’re looking to integrate eCommerce within WordPress. And better still, since it’s free, it makes it a lot easier to give it a good test to make sure it’s right for your own needs. You can even grab one of the free WooCommerce specific themes from WooThemes to see how it looks. Woo also seems to be adding more and more payment gateway extensions, on a regular basis, which is good to see. Thankfully, eWay is already support which is great news for us over here in Aus since it’s probably one of the most popular ones here. As far as Cart66 goes, I haven’t used it personally, but I have heard good reports about. I’ve heard that it’s very easy to setup although I have also heard that if you have a lot of products it can get a bit cumbersome to use. From what I know (and don’t quote me on this), but I believe you simply add a product to a Page or Post using a WP Shortcode. If you have a heap of products, I could imagine it taking quite a while if you needed to update every one since you need to edit every single page were the product(s) appear. Not sure if this is the only way you can manage products within Cart66 or not, so it’s probably worth investigating if you are planning on using it for a shop with a lot of products. Can anyone please give me some links to shops made with woocommerce ? I am having a shop made in prestashop but I am thinking maybe I made a mistake by not getting woocommerce insteed. It will be a shop with only ONE product and thats it. You will be able to buy the product like this: 15 , 30, 40 , or 50 at the time. So can anyone come with + & – using the Woocommerce and + & – unsing prestashop ? I will be using Paypal to start with. One of the main differences between Prestashop and WooCommerce is that WooCommerce is a plugin for WordPress so you will need to install WordPress for it to work. I haven’t used Prestashop myself but it looks to be a stand alone eCommerce product. It’s hard to compare the two since they’re two completely different types of products. It’s not like simply comparing two WordPress eCommerce plugins. You’d really need to decide what sort of features you need on your website to make an informed decision as to which product would be best to use. This is good plugin but have 1 mistake, In attribute select option work but when we add text field than it do not appear in variation, Almost every shop website have input fields on single product page for example I am creating printing shop. If my customer want to order for business card than i have to ask that what should be title on card, What will be name, address etc. If customer is giving order for flyer than what should be title and text etc. If you want to get extra information from your shop visitors such title, name & address fields, then you can use the Gravity Forms Add-on (http://www.woothemes.com/extension/gravityforms-product-addons/). Combined with the Gravity Forms plugin (http://www.gravityforms.com/), it allows you to create some really powerful forms. Hi Anthony, Very good article – thanks. I am trying to find a suitable commerce solution, trying to decide between Volusion and Woocommerce. I understand that Volusion is standalone so it is different.. my question is – can the woo commerce theme stand on it’s own (once wordpress is installed) or does it have to be part of a website with more than just the commerce store? appreciate your help .. thanks ! Thanks James. Yep, you can certainly just have a shop site with WooCommerce. Even though it’s a WordPress plugin you don’t necessarily have to have any “std” WordPress pages or a blog, if you don’t want to. You should check out some of the WooCommerce themes on the WooThemes website or the ThemeForest website. In particular, have a look at any demos that are available just to get an idea of the types of sites that can be created. Good article James. I’m planning a new webshop with Woocommerce. However, I’m in doubt. My catalog has more than 5500 titles. Each titles has over 10 attributes. Do you think Woocommerce can handle this in an acceptable speed? Is it also possible to use other free plugins (from the WordPress-site) in combination with Woocommerce? For instance: I would like to use tabbed-view to view my product-details. I wouldn’t think there’d be a problem with having 5500 products. I very much doubt there’d be any limits imposed in the plugin itself. It might be worth posting on the WooThemes forum though to see what other peoples experiences have been with such a large number of products. As far as other WordPress plugins, yep it’s certainly possible to use them but it’s going to depend entirely on the plugin and what it does. If you’re looking to style your store in a particular way, then you really should be looking at getting a custom theme developed, rather than trying to use a plugin that’s not specifically tailored for WooCommerce. I’m a newbie and I’m attempting to use woocommerce. I have a problem that on one of the product pages, it also changes my banner/header to the product image. So I have the product image and the same image in my banner heading-although cropped. Trying to figure out how to correct and restore my original header image. Thanks for help. It’s wordpress 2010 child theme. Hi Anthony, very good article. i´m planning opening my shop with wordpress and woocommerce. My main concern is speed…when it comes to ecommerce having a slow website is a killer. Do you think that wordpress and woocommerce will perform fast??. I had built some sites in joomla+virtuemart but man they are slow…that´s why i´m looking now at wordpress. I think maybe wordpress is faster than joomla.. Anyway, what do you think about the woo themes? because i have heard they killed the speed of your wordpress site, this has happened to me a lot in joomla with other flamboyant templates and plugins. Thanks for your comment. I didn’t noticed any decreased speed in the site when using it with the plugin. Admittedly though, my testing with it for this review certainly wouldn’t have been taxing it with lots of products. As far as general speed goes, like most sites, it’s all going to come down to how good the particular theme that you’re using, is coded and the speed of your host. It always pays to set your site up on some decent hosting, even if it is a little more expensive. They’re usually the ones that don’t overload their servers. The other thing to take into account are plugins. It’s always wise to use quality plugins. Having one or two poorly written plugins is worse than having dozens of well coded ones. Can you recommend some good quality themes? what is the best plugin for ecommerce in wordpress?. I need some good options, i don´t want my site to be slow. Good point with the plugin quality and hosting providers, i think is critical to choose a good one..
There’s lots of good quality themes around. Try checking out some of the themes on WooThemes or ThemeForest. Even the WordPress website has some high quality themes in their Free Themes Directory. As to what is going to suit yourself, it’s all going to depend on what features you’re after. All themes are different in some way. Same goes with eCommerce plugins. There’s a number of choices nowadays such as WooCommerce, WP eCommerce, JigoShop and numerous others. Each have their own set of features so you need to work out what is suitable. Hi Anthony, thanks for this review. Like a few others, I am looking at an online store using woocommerce and wp; I’m using the demo version at the moment and have a small issue, hopefully you or someone can help. At present, all my products are on one page (shop, or collection etc). Is there a way (I assume there must be) of grouping items into sub pages / sub products (so someone rolls over ‘shop’ and below that there is (e.g. ), lighting, furniture, seating etc and the relevant products are ‘only’ under these respective pages ? If you have a look at the Wootique Demo you can see an example on the “Shop” menu where they’ve specified the individual product categories. Each product in the respective category appears on its own page. Thanks Anthony, really appreciate it. Changed the theme and see the impact, presumably there’s a quick way of reclassifying my products into the different categories ? We’ve built a couple sites recently using WooCommerce, one a migration from an old Cubecart site with 1,500 products in 80 categories. Am VERY impressed. It’s not a high-end product like Magento or CS-Cart, but will work well for most small businesses who appreciate a storefront with builtin blogging and good CMS functionality. In my case to get the right look against the clients photoshop design, I ended up using one of my trusty Genesis framework child themes instead of the woo themes. I found it much easier to modify the theme design to exactly how I want. I also included the Gravity forms plugin allowing easy additional forms throughout the site. Some knowledge of hooks and filters helps, along with the Genesis woocommerce connect plugin. It’s a winner package that’s easy to setup and manage. Thanks for leaving a comment Kevin. It’s always good to hear success stories like this. Sounds like WC really worked for you and a shop with 1500 products ounds pretty impressive. Great post on WooCommerce. I’ve used eShop & WP e-Commerce in the past, and while they got the job done I’ve found WooCommerce much easier to set up & tweak. I’m about to embark on a large project using WooCommerce on WP Engine. I’ll let you know how I fare. I have a WooCommerce based project too but still looking for a good hosting. Are there no issues on shop based page with the caching setup of WP Engine? Thanks Joel. I’ve not use WPEC for a client yet, and to be honest, not sure I ever would. I’ve only ever played with it on a test site. Although I’m sure it’s a great product, I’ve very rarely heard anyone say anything good about it (especially when it comes to upgrading!). Good luck with your new project. Hope it works out well. Thank you for producing this comprehensive report. Tell me, is this application good for downloadable ebooks? I am starting an online publishing house, and I want a Pay Here and Click Here to Download platform much like Clickbank. Also, is it correct that Wocommerce only offers PayPal facilities? I covered both those points up above. Yep, you can certainly use WooCommerce for downloadable products like eBooks or electronic files. 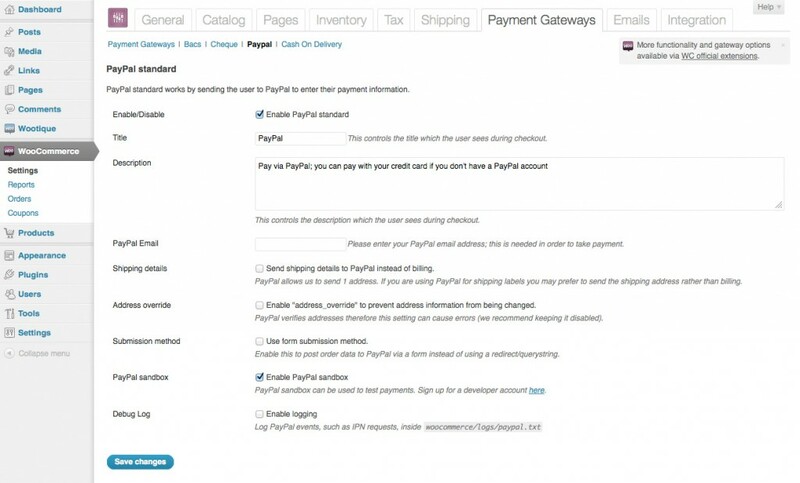 And nope, there’s lots of other payment gateways that you can use with WC, besides PayPal. Checkout the different payment gateway extensions. I liked your article and the information. 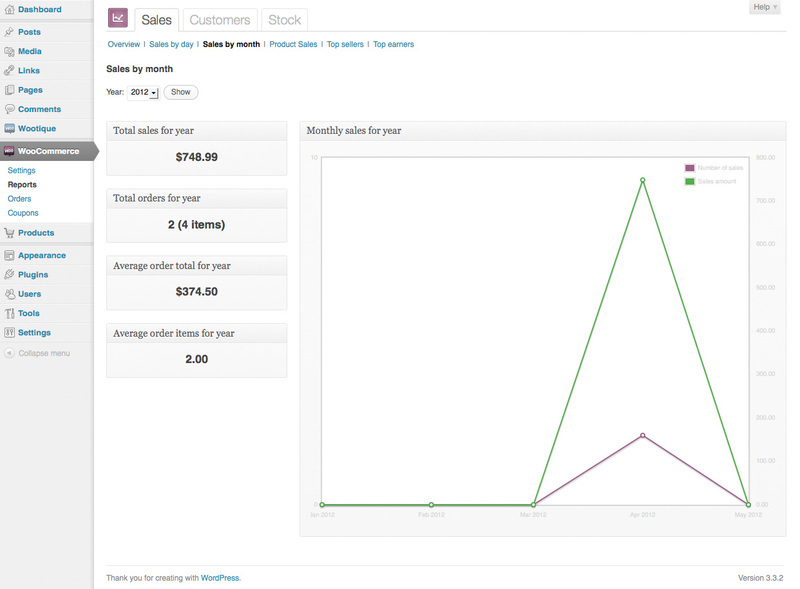 I’m testing woo-commerce right now and it seems to be a good product so far. However I was wondering if anyone from Canada or the US, has tried entering postal code wildcards in the local delivery section? I can enter a single code like R2T 3Q2 and this will show up as an option. However R2T * (the star being the wild card) gives no result when a client is calculating shipping. Just wondering if anyone else has tried this or has a different experience? Hi Thanks for telling me about that. The range seems good in if it is just numbers however in my case I have letters and numbers so, it doesn’t seem to understand that kind of range combo. If I try from R2T 3Q2 – R2T 3R2 it does not recognize this. In my case the wildcard * would be best, but it does not seem to work. Thanks though for looking into that for me. Good Review of product and great queries and replies – a really good conversation happening here! My site is a vacation property and I’m simply looking to invoice (after qualifying the potential guest) with a credit card option. I don’t have a product catalog per se – dates/seasons/rates vary from booking to booking. Although technically, you probably could do it with WooCommerce, I would imagine it would be quite difficult to manage, especially since each “sale” has different costs. You really need something that’s more specialised towards taking bookings/reservations. It might be worth checking out something like easyReservations. I haven’t used it so can’t comment on it, but it looks more suited to what you’re trying to do. This article review is by far the best on this subject. I am working on a new site and want to integrate the woo commerce plugin. I have not come across a more thorough review jam packed with insightful information. I understand that you are not an affiliate, but I strongly encourage you to become one immediately. You have brilliantly broken down every component of this plugin into easy to understand language for beginners and advanced users. Even Woo Commerce doesn’t explain how to use the plugin as well as your article. Therefore, why not get paid for being an affiliate for Woo Themes. I wish that more tech companies, WordPress included, would hire or reach out to bloggers like yourself, to write copy for the layperson to understand. Please know that you are in a very unique category for being a brilliant designer and blogger. I look forward to reading more from you. Thanks again for the indepth article on Woo Commerce plugin. I love how WooCommerce operates and how clean the interface is. But as with all carts (WP plugin or standalone like CS-Cart), I always seem to have a challenging configuration. 1) Multiple subscription types per product – for each product, the user can select how long they would like to subscribe. The longer the subscription period, the enter the deal. 2) User account management within the WP Admin – users manage their profile, payment methods and orders from the WP Admin instead of the front-end. With Roles and Capabilities, I long for the moment when plugins stop using the front-end for these purposes. The WP backed is a glorious home for user account management! And as far as I can tell, WooCommerce doesn’t mention the best way to accomplish this. Those two situations (#1 is critical) are what hold me back from commiting my efforts to WooCommerce. Thanks for leaving a comment. Unfortunately, subscriptions, especially recurring ones, is one thing that WooCommerce doesn’t really do all that well. There is a subscriptions extension, but it only works with PayPal and Stripe (and if you live outside the US, then you can’t use Stripe anyway!). Also, with PayPal, it’s actually PayPal that manages the recurring payments, rather than WC so if you need to cancel the subscription, you need to do it through PayPal, rather than through your online store. As you pointed out, there’s also not a lot of options when it come to user management. I don’t think this is a big deal though, but obviously that would depend on the type of site you’re trying to implement. Great review and conversation in this artcile. What I’m looking for are opinions on ecommerce plugins for WP that allow for part payment of orders. My review and research has not found any that provide this functionality straight out of the box or with a plugin, without customisation to the core code. Do you know if woocommerce or any others out there will allow for this, such as paying a deposit as a fixed amount or percentage of the order? Hi Michael. Thanks for leaving a comment. That’s a good question. I don’t know of any that allow for part payments of products. Truly and awesome review. I don’t think I’ve ever read one that even comes close it. Thank you. You’re a legend. I need ecommerce plugin where users can sell their products from front end. When making a search on the net I found someone mentioned that woocommerce allows to do that. But after installing it and reading docs couldnt find anything about that feature. Is it possible? WooCommerce is an eCommerce plugin that lets you sell products on your own website. It doesn’t allow for your end users to sell products on your site though. With some custom development, you could probably create a product in your store from details that are submitted by a user, but it’s not something it handles ‘straight out of the box’. I think what you’re looking for is MarketPress from WPMU Dev – they specifically state that with a multipress site, you can set up user stores like Etsy and even take a percentage of their sales. I’ve never used it though, so I can’t speak to reliability or ease-of-use. Thanks for this information – I am looking to implement a store on a pre-existing site, and I cannot find many articles detailing the capabilities of the big WP ecommerce plugins (except for everyone bashing “WP e-commerce”). I’m trying to decide between WooCommerce, Cart66 and MarketPress, so this article was very helpful – thanks! I just installed mystile wooecommerce theme and the banner image is not showing up? What it is going on? loaded jpg then png still not working…. I’m using twentyeleven child and woocommerce. My problem is that for some reason on the product page Woocommerce replaces my banner header with a cropped pic of the product. How do I restore my original header/banner image on the product page? Thanks for great review. I really hesitated about which cart to choose WP eCommerce or Woo. And after your review I decided to start WooCommerce shop and it was definitely right decision. Thanks again! PS: I also found this article to be useful. Thanks Erich. I’m glad you found it useful. Good to hear the plugin worked out well on your site. Thanks for that link too. Hi Christina, I’m pretty sure you can’t get PayPal to calculate the shipping. As far as I know you can only use it to process payments. As someone who is more of an end user than designer this was/is and awesome thread. I have been struggling with design options for several weeks now..I want the blog and social media feel that WP offers but need a stable environment for and ever changing and growing product list numbering around 2-3K. After looking at every possible standalone option the WooCommerce plugin just looks better and better..
Hi CJ! Thanks for leaving a comment. Glad you enjoyed the post. It may not be perfect for every situation but WooCommerce certainly is one of the better eCommerce plugins available. The USPS extension seems to flake out if your signed in as an admin and doing a test. The issue (from what I can tell) is that you sign in as a standard http user and then when go to the cart to test your using https:// at this point the data get lost somehow and throws up a -1 instead of the cost. I have been using woocommerce and shelflife theme for a while and made lots of sales. WooCommerce is only a year old but I expect it to get better with time and send querys to their support team always get answered. I have yet to tackle USPS shipping issue with them because it does not affect my shoppers as they all sign in as guest and it does not break in this mode. Thanks for that little tip Edward. Will keep it in mind if I ever have to use the USPS extension. Great to hear that the WooCommerce plugin is working well for you. Speaking of USPS shipping. We installed this plugin several weeks ago and it has not worked. Woo just sent out the 2nd update and the 1st class shipping parcel returns bad shipping rates. At least there now is a 1st class parcel option. Earlier versions didn’t have it. Sorry I can not recommend Woocommerce as a shopping cart. Much too flakey. Wish we had gone with something else. It has been a hugh headache and we are months behind schedule because the platform is poorly designed and supported. Thanks for leaving a comment Andrew. It’s good to hear what everyone’s experience with it has been like, good or bad. Sorry to hear you’ve been having issues. Anthony, thanks for taking the time and effort to write this review and interact with the comments. Perhaps someone needs to write a book on WooCommerce! By the way, I tried Cart66 and was very disappointed. The crashed my system, but only provide support to paid users… but tell you to try the free version to be sure you want the product! Thanks Robert. Interesting to hear about your Cart66 experience. I haven’t used it myself but have heard good reports from others. Although, I’ve also heard that it’s really only suitable for shops with a small number of products. And yep, a book is coming. It’ll make a nice companion to my Easy WP Guide WordPress manual.